1. 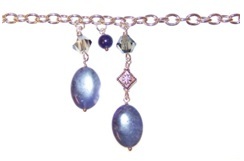 Add 1 – Sodalite 6mm Semiprecious Round to a ball pin. Make a 90º bend in ball pin above the bead. Using round nose pliers hold the ball pin near the angle and bend it around the pliers to make a loop. Wrap down around ball pin creating as many coils as you can. Trim any extra. Repeat 5 times. 1. 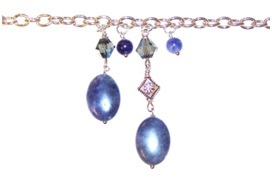 Add 1 – Sodalite 13x18mm Semiprecious Puff Oval to a ball pin. Make a 90º bend in ball pin above the bead. Using round nose pliers hold the ball pin near the angle and bend it around the pliers to make a loop. Wrap down around ball pin creating as many coils as you can. Trim any extra. Repeat 9 times. 2. Open the eye of 1 – Antique Silver-Plated Eye Pin and add the loop you just created. Close the eye of the eye pin. 3. Add 1 – Black Diamond AB 8mm Crystal Bicone to the eye pin you just added. Make a 90º bend in eye pin above the bead. Using round nose pliers hold the eye pin near the angle and bend it around the pliers to make a loop. Wrap down around eye pin creating as many coils as you can. Trim any extra. 4. Repeat Steps 1-3 one time for the other drop. 3. Add 1 – Antique Silver-Plated 4x10mm Diamond Metal Bead to the eye pin you just added. Make a 90º bend in eye pin above the bead. Using round nose pliers hold the eye pin near the angle and bend it around the pliers to make a loop. Wrap down around eye pin creating as many coils as you can. Trim any extra. 4. Open the eye of 1 – Antique Silver-Plated Eye Pin and add the loop you just created. Close the eye of the eye pin. 5. Add 1 – Black Diamond AB 8mm Crystal Bicone to the eye pin you just added. Make a 90º bend in eye pin above the bead. Using round nose pliers hold the eye pin near the angle and bend it around the pliers to make a loop. Wrap down around eye pin creating as many coils as you can. Trim any extra. 5. Add 1 – Antique Silver-Plated 4x10mm Diamond Metal Bead to the eye pin you just added. Make a 90º bend in eye pin above the bead. Using round nose pliers hold the eye pin near the angle and bend it around the pliers to make a loop. Wrap down around eye pin creating as many coils as you can. Trim any extra. 6. Open the eye of 1 – Antique Silver-Plated Eye Pin and add the loop you just created. Close the eye of the eye pin. 7. Add 1 – Black Diamond AB 8mm Crystal Bicone to the eye pin you just added. Make a 90º bend in eye pin above the bead. Using round nose pliers hold the eye pin near the angle and bend it around the pliers to make a loop. Wrap down around eye pin creating as many coils as you can. Trim any extra. 7. Add 1 – Antique Silver-Plated 4x10mm Diamond Metal Bead to the eye pin you just added. Make a 90º bend in eye pin above the bead. Using round nose pliers hold the eye pin near the angle and bend it around the pliers to make a loop. Wrap down around eye pin creating as many coils as you can. Trim any extra. 8. Open the eye of 1 – Antique Silver-Plated Eye Pin and add the loop you just created. Close the eye of the eye pin. 9. Add 1 – Black Diamond AB 8mm Crystal Bicone to the eye pin you just added. Make a 90º bend in eye pin above the bead. Using round nose pliers hold the eye pin near the angle and bend it around the pliers to make a loop. Wrap down around eye pin creating as many coils as you can. Trim any extra. 1. Open one 5mm Jump Ring; add the loop of the lobster clasp and the end link of the chain. Close the Jump Ring. 2. Count to the 50th link in the chain; open one 5mm Jump Ring and add the loop of one 2-Bead Drop and the 50 th link. Close the jump ring. 3. 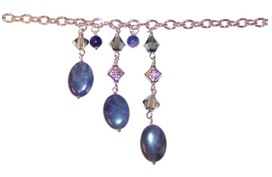 Skip one link in the chain; open one 5mm Jump Ring and add the loop of one Sodalite 6mm Semiprecious Round Drop and the link. Close the jump ring. 4. Skip one link in the chain; open one 5mm Jump Ring and add the loop of one 3-Bead Drop and the link. Close the jump ring. 5. 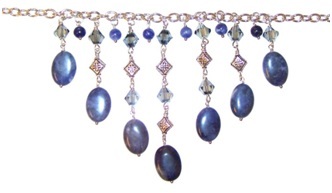 Skip one link in the chain; open one 5mm Jump Ring and add the loop of one Sodalite 6mm Semiprecious Round Drop and the link. Close the jump ring. 6. Skip one link in the chain; open one 5mm Jump Ring and add the loop of one 4-Bead Drop and the link. Close the jump ring. 7. 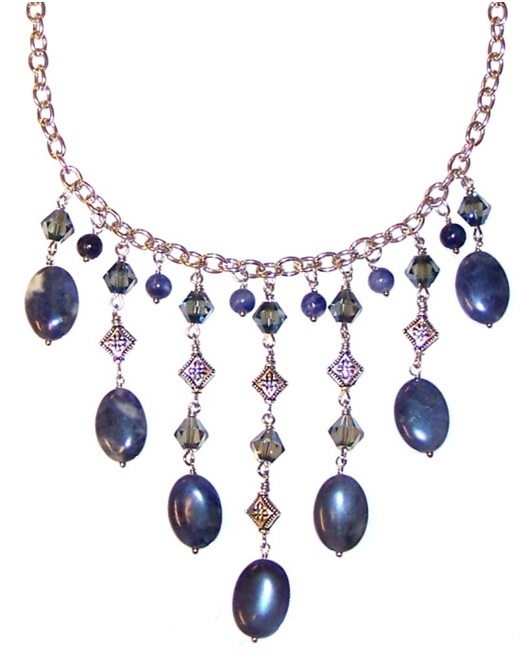 Skip one link in the chain; open one 5mm Jump Ring and add the loop of one Sodalite 6mm Semiprecious Round Drop and the link. Close the jump ring. 8. Skip one link in the chain; open one 5mm Jump Ring and add the loop of one 5-Bead Drop and the link. Close the jump ring. 9. 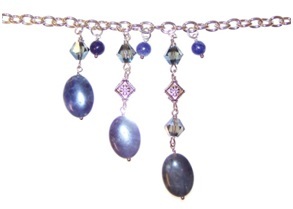 Skip one link in the chain; open one 5mm Jump Ring and add the loop of one Sodalite 6mm Semiprecious Round Drop and the link. Close the jump ring. 10. Skip one link in the chain; open one 5mm Jump Ring and add the loop of one 4-Bead Drop and the link. Close the jump ring. 11. 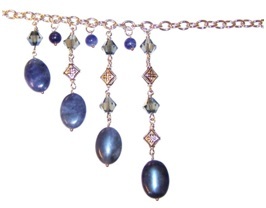 Skip one link in the chain; open one 5mm Jump Ring and add the loop of one Sodalite 6mm Semiprecious Round Drop and the link. Close the jump ring. 12. Skip one link in the chain; open one 5mm Jump Ring and add the loop of one 3-Bead Drop and the link. Close the jump ring. 13. Skip one link in the chain; open one 5mm Jump Ring and add the loop of one Sodalite 6mm Semiprecious Round Drop and the link. Close the jump ring. 14. Skip one link in the chain; open one 5mm Jump Ring and add the loop of one 2-Bead Drop and the link. Close the jump ring. 15. 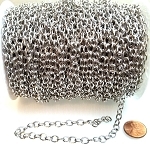 Open one 8mm Jump Ring and add the last link of the chain. Close the jump ring. You are done, these instructions make a necklace that is 22 ½ inches long. To make the necklace longer add more 8mm jump rings to the end of the chain. We hope you enjoyed this beading project! For more beads and supplies please shop on our website at www.Bead3.com.